Stuttgart, capital of the state of Baden-Württemberg, is located near the Black Forest. This is a beautiful city where culture, tradition, and technology co-exist in perfect balance. Stuttgart, which is located inside one of the greatest wine regions of Germany, is a city of many facets, with magnificent palaces and castles and modern facilities on major roads always busy. It is the city of Mercedes-Benz and Porsche and has an intense cultural and artistic activity. Monuments and theaters: in town worth a visit the Neues Schloss, the new castle, a palace in the late Baroque style which in some ways recalls Versailles, and the Altes Schloss, the old castle, a magnificent medieval building. One of the most interesting places is the Weissenhofsiedlung residential district, with buildings designed by the greatest architects in the world. One of the symbols of Stuttgart, which is now a national monument, is the Fernsehturm, television tower, opened in 1956 and 217 meters high. Very interesting is also the indoor market in art nouveau style, Markthalle, in the Marktplatz, as well as the Wilhelma - the largest zoo and botanical garden in Europe – with over one thousand different species. Stuttgart is a city very active in cultural terms, with over 40 theaters. Very interesting are the cultural programming at the National Theatre and Opera House and Staatstherater Stuttgart, the Opera House and National Theatre. The Staatsgalerie, the National Gallery of Art, houses a collection of drawings, watercolors, prints, books, photographs and works by Canaletto and Rembrandt. Shopping and entertainment: the shopping street is the central Königstraße, with elegant shops, restaurants and large stores. In Marktplatz there is the elegant department store Breuninger. Even the Schulstraße is a destination for shopping, and was the first pedestrian street of Germany in 1953. In Calwer Straße there are clothing stores, leather goods and jewelry. For entertainment, not to be missed is Bohnen district, near the market square, where there are wine bars, international restaurants and many shops. Here are the best Kneipen and Weinstuben of the city, trendy bars and cafes. Other places for an evening meeting are the Palast der Republik and the pubs along Schwabenzentrum, the area Wilhelmplatz, and in general all the districts west of the city. 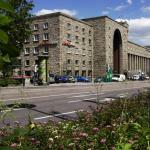 Hotels: The offer of hotels in Stuttgart is very broad and diverse. The prices are quite high in the centre, but become cheaper in the outlying districts, especially in the west of the city. 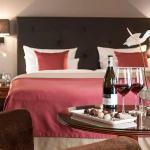 During high season it is advisable to book in advance. The neighborhood where tourists prefer to stay in Stuttgart is the area around Wilhelma. 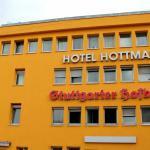 The Hotel Hansa is a friendly and comfortable hotel located in the heart of Stuttgart, a few steps from the pedestrian "Königsstrasse" and is especially recommended for those traveling in groups. 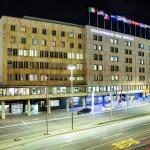 The Mövenpick Hotel Stuttgart Airport, located opposite the airport of Stuttgart and just 400 meters from the new exhibition center Messe, offers easy access to the centre of the city by S-Bahn. 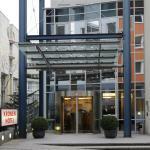 The Kronen-Hotel is located in the heart of the city of Stuttgart, in a quiet street near the station. The most interesting places in town, two castles and shopping streets are within walking distance.